Here's our best kept secret. I'm not kidding. We knew it was good, but our customers are going sold on it. They call it mechanic in a bottle. It's Yamaha Ring Free Plus. Use as a constant treatment, or as a “Shock Treatment.” For two stroke and four stroke engines. Reduces carbon deposits in the ring grooves of 2-stroke engines, preventing ring jacking and sticking which can lead to scuffing and/or engine seizure. Restores efficient spray pattern in fuel injectors partially blocked by carbon deposits. Two doses are recommended. Particularly good for old engines that have had all the other treatments but still just don't run that well. Follow the instructions for Ringfree, mix with gas and pour this in, the oil in your engine can turn black immediately as it cleans. Replace the oil with a second dose and your engine will be much improved. 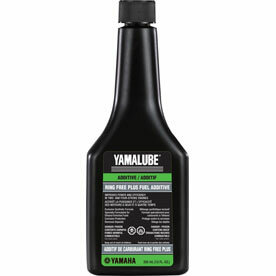 Just wanted to let you all know about a product that Yamaha has called "Ring Free" part. You just add a couple oz. to the fuel. It will De-carbon your valves,cumbustion chamber, and piston and rings. Its great stuff. After about 2-3 tanks of gas drain the oil, the carbon will get washed into the oil and make it black. It Improves power and efficiency in both 2 and 4 stroke engines.